Do you constantly feel like your workday is getting away from you? Too many loose ends, too many distractions? The Pomodoro Technique might help. It was developed back in 1992 to help workers improve their focus and productivity. And it has legions of devoted followers. 1. Choose a single task to be accomplished. 2. Set the Pomodoro (i.e. timer) to 25 minutes. 3. Work on that task until the timer rings, then record that Pomodoro as completed. 4. Take a five-minute break, then resume the task (if it's not done) or start a new one. 5. After every four Pomodoros, take a longer break. The idea here is to narrow your focus to a single task at a time, thus cutting out the distractions of other projects. The key tool here is the timer. Anything will work, but why not leverage your smartphone for the best possible experience? 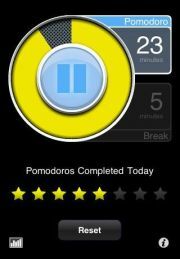 Android Market and Apple's App Store are home to dozens of Pomorodo-timer apps--some free, some costing a few bucks. At their most basic, they time out your 25-minute work sessions and 5-minute breaks. But the more sophisticated ones will track your progress over time, award stars to help keep you motivated, and provide nice visualizations of the timers. If you've found a Pomodoro app you like better, by all means give it a shout-out in the comments section. Also, if you spend most of your day in front of your PC, there are Web- and software-powered Pomodoro timers as well. Windows 7 users should check out the Windows 7 Pomodoro Gadget, and Pomodori is a decent option for the Mac crowd. There's also browser-based Focus Booster, which runs on Adobe Air. Personally, I like most of the apps a lot better. The only downside is the extra drain on your battery, especially if you run them all day.